Discover Australia Gold Coin from the prestigious Perth Mint are inspired by the iconic animals and birds that are unique to the continent. Strictly limited mintages and the mint's trademarked .9999 gold fineness have made these stunning proof coins a hit with the world's numismatists. The series initially began in 2009-10 with 'The Dreaming'. It proved so popular that it was quickly followed by the ‘The Dreaming’ 2011 set and the more recent 'Australian Animals' collection that made its debut in 2012. 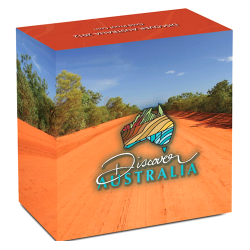 Discover Australia gold coins are available in several sizes and are legal tender backed by the Government of Australia. Explore a wide range of Discover Australia gold coins featuring beautifully depictions of Australian animals such as the Red Kangaroo, the Goanna and the Kookaburra at coininvest.com.